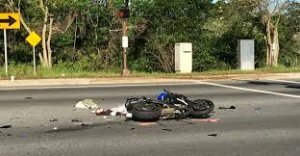 Motorcyclist Killed In Crash On NW 19th Street and Wyndham Way In Boca Raton | Schuler, Halvorson, Weisser, Zoeller & Overbeck P.A. A 19-year-old Boca Raton man is dead following a motorcycle crash involving a truck, according to the Palm Beach County Sheriff’s Office. According to police reports, the fatal motorcycle accident happened at the intersection of NW 19th Street and Wyndham Way west of Boca Raton. It involved three other vehicles. Reports indicated that the 19-year-old motorcyclist was riding his Kawasaki motorcycle along the northbound lanes of NW 19th Street when the driver of a 2012 Sedan drove into his path while attempting to make a U-turn near Sabadell United Bank. The motorcycle was unable to avoid the collision and crashed into the Sedan. Although two additional vehicles went on to crash into the Sedan, which was being driven by a 62-year-old man, no additional injuries were reported in connection with the crash. The motor vehicle crash backed up traffic for hours on Wyndham Way. Drivers are advised to use alternative routes. Investigations into the fatal motorcycle accident that claimed the life of a 19-year-old Boca Raton man is ongoing.